Our first day in boot camp began at 0500 on 14Sep63. It had been a short night, but reveille sounded (via bugle) on the base at that hour. Taps sounded at 2100 (9 p.m.). The uniform of the day prescribed for us green recruits consisted of the regulation utility cover (hat), yellow sweatshirt (with the Marine Corps emblem on the chest), web belt, green utility trousers, black socks, and tennis shoes. Someone must have marched us to chow. You never miss a meal in boot camp. 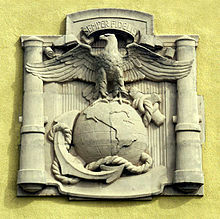 I believe our new platoon went to the mess hall of 1st Battalion, Recruit Training Regiment, near Receiving Barracks. The other two battalion mess halls stood half a mile away. At some point in the morning, we took tests, filled out papers, and mailed our civilian clothes home. No recruit could possess any article of civilian clothing. That included frippery such as wristwatches. We never knew the time. The mailing sergeant offered us the option of donating our clothes to Navy Relief. I think I had worn a wash-and-wear suit to San Diego, and I declined. Finally, Receiving Barracks expelled us to a side yard to stand in formation. Now for the first time, our senior drill instructor appeared. He wore the famous campaign hat and the wide black belt that marked him as the platoon commander. Other DIs wore the regulation web belt. He wore a perfectly pressed uniform with gleaming, spit-shined shoes. He must have called us to attention and introduced himself. He was not friendly, but neither was he screaming. The whole procedure lacked the drama of the movie DI in Full Metal Jacket. We could sense he was fierce. The Depot apparently had run short of drill instructors, because we only had two: Staff Sergeant J. W. Guinn, the senior drill instructor, and Sergeant White. I don’t believe I ever knew Sgt. White’s first name or initials. I am not even sure he appeared on the first day. He does not appear in the platoon book. Two other DIs replaced him in the third or fourth week. Sgt. Guinn marched us in our new-boy uniforms – more a mob than a platoon – to 3rd Battalion area, on the edge of the recruit area near the runways of Lindbergh Field. We now belonged to Platoon 373. We formed the third of four platoons in K Company, 3rd Recruit Training Battalion. The others were 371, 372, and 374.
its own drill instructors, typically three. Boot platoons lived in Quonset huts. 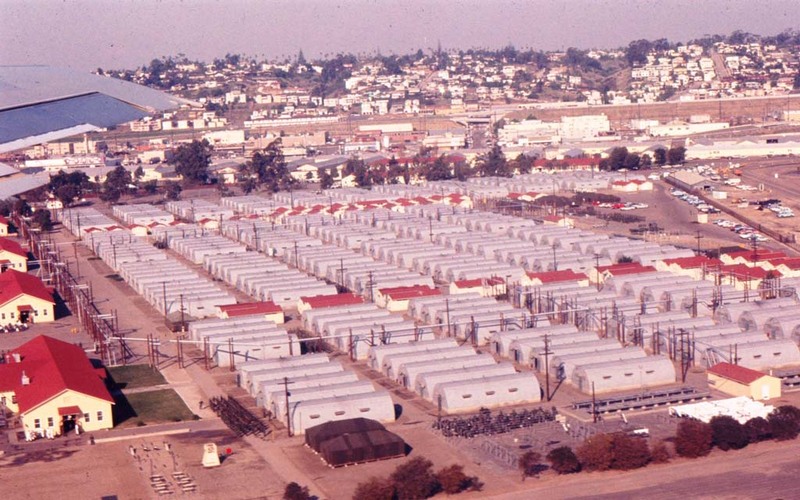 More than 700 huts had arrived during the Korean War, and the base contained separate areas for three recruit battalions. A wooden mess hall and several heads (lavatories and showers) served each battalion. Now modern barracks have replaced these buildings, but the Marine Corps, ever faithful to tradition, has kept perhaps a dozen as tokens. The photograph above shows the recruit area where we lived, off-limits to visitors. The buildings with red roofs on the left side of the picture as you face it are mess halls, 3rd Battalion being the nearest. The smaller red-roofed buildings are heads (a bathroom and showers: no partitions for the facilities). The picture shows what appear to be two platoons, one moving in formation between the Quonset huts and 3rd Battalion mess hall. There seems to be a second at the bottom of the picture next to what appears to be the wash racks. This looks like a conditioning course. Our platoon occupied five huts. Three of them housed double-decker bunks, with 24 men to a hut (72 to a platoon). One hut served as the squad bay, empty except for our rifles locked in a rack in the center. Recruit Training Regiment issued no ammunition to recruits except at the rifle range. Possession of ammunition off the range meant court-martial. We sat on our buckets in the squad bay most nights, shining brass and boots, cleaning rifles, and writing letters. We learned to field-strip our rifles there. The fifth hut was the duty hut, where the DI on duty had an office and sleeping quarters. We did whisper to each other while making the racks (i.e., bunks) before breakfast. Under the eye of the DI, we spoke not a word. Otherwise, the entire platoon underwent punishment — push-ups, squat thrusts, and so on. – No head calls. These took place only at intervals during the 16-hour training day. Shaving and showers took place before lights out. – No water, except at meals. A heat wave called a Santa Anna settled in September 1963 on San Diego, and Sgt. Guinn took that as an opportunity to teach us water discipline. – No chewing gum (unmilitary). – No hands in pockets (unmilitary). On our first night in the company area, we received sheets, blankets, and towels, and then showered and shaved. Back at attention on the company street, Sgt. Guinn gave us the command “at ease,” meaning your left foot stayed in place but otherwise you could move (all marching began on the left foot). Then he lit the smoking lamp (a shipboard tradition). The command was, “The smoking lamp is lit for one cigarette.” It was pronounced wan. In unison, we answered: “Sir, the smoking lamp is lit for one cigarette.” After a few minutes, he gave us “Lamp is out.” Again we repeated the command in unison. During the smoking break before lights out, he relaxed and talked about what faced us in boot camp. “We have to break you down before we can build you up,” he said. Finally, he said if any recruit did not wish to remain in “my Marine Corps,” that recruit could see him in the duty hut after Lights Out. Bugle calls signaled these important events, especially reveille, lights out (taps), and To the Colors (raising or lowering the American flag). The next day, the answer came from the platoon commander. You can’t quit. After taps, a recruit had banged the knocker on the hatch (i.e., door) of the duty hut, entered, marched three paces, executed a right face, marched two paces, stood at attention without looking at the DI, and requested permission to speak: “Sir, Private ____, Platoon 373, requests permission to speak to the drill instructor.” SPEAK, came the command. The recruit said he wished to leave the Marine Corps. Sgt. Guinn asked him why. “Sir, I’m a homocyclist,” said the recruit. We never knew who said that. He probably stayed with the platoon. I think it shows some recruits would say anything to get out of there. If you had a physical problem, they recycled you to another platoon. No one wanted to repeat boot camp. One recruit did the final combat run — three miles in helmet, pack, and rifle — although he had pneumonia. He made it and graduated. Very fabulous, and very funny. More please. The DIs had some funny lines, but we stayed in terrorem. Why did I sign up for this? we kept asking ourselves. I think it was a very interesting story. It told a lot about life in boot camp, and I think it is really ironic that his name was Sgt. Gunn because–you know–marines use guns. There where a lot of good shots in the marines. I had the privledge of being the BAR man in live firing. fire team firing, our fire team recordered the highest score up to January 1960 ever fired. I had one funny experience, however it wasn’t funny to the young recruit it happened too. His name was Danny Fenton a red headed kid from Texas. The D I would call us in to the duty hut one at a time. Then you better stand at attention and don’t look around, you keep your head straight to the front. Well the D I would walk around Danny when he got to his back the, the D I would drop a big metal plate behiind him it made a very loud noise and Danny would Jump about two feet off the ground but you better not laugh. I kind of felt for Danny but that was part of our training. I have a few more stories but I never will forget that time in 1959. It’s sad but the BAR is almost extinct. We saw one demonstrated at Pacific Combat Zone, the re-enactor field of the National Museum of the Pacific War in Fredericksburg, Texas. Tell us some more of your recollections.